a few things about the roller coaster ride that is teaching – Teachers Have Lives Too! 1) a lot happens in the background — teachers get hired, teachers get reprimanded, etc. Nothing is out in the open, there is very little transparency. 2) my kids go through a lot everyday. Compared to their situations, my life is a piece of cake. 3) never assume that kids are just being lazy when they miss classes or forget to do homework. usually there is a pretty damn good reason why school is not their #1 priority right at that moment. 4) never lower your expectations for a student, but keep it realistic. 5) ignorance is bliss. I know that I have homeless students, I know many of my students have ‘case managers’, live in half way homes, have been in the foster care system since they were babies, been raped, witnessed murders, have absent working parent/parents/grandmothers/siblings… guardians. I know about them, but I’d rather not HAVE to (meaning i wish it were a different story). 6) I can and will do my best. but sometimes, even that is not enough. 7) I still have a lot to learn. Now a bit about my school. It’s changed a lot in the past 3 years. My first year of teaching, I broke up 2 fights in my classroom, had my laptop stolen, things thrown at me in the middle of class, every curse word hurled at me and a parent threaten me. My second year I had a desk thrown at me, a kid threaten me and a parent scream at me. This year, I’ve had nothing stolen, no curse words (directed at me) and just one kid that threatened to punch me in the face. It’s changing. So is the surrounding neighborhood. The hood is becoming less of a “hood” and more of an immigrant neighborhood. Now I have more issues with kids not speaking up enough in class than kids who can’t seem to keep quiet. I teach at a “hard to staff” high school in San Francisco. SFUSD, like many other school districts, is large, unorganized, bureaucratic and dauntingly political. The school site itself is disappointingly political. I try my best to avoid it all and just focus on my own classroom. For example, right now the staff is in the midst of a hats allowed in school vs. the current no hats rule. this is a chart most first year teachers see. 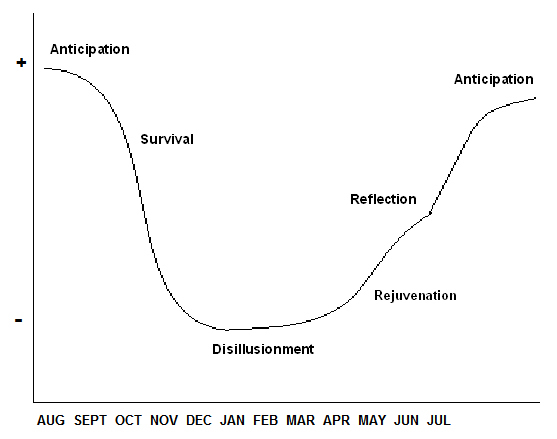 It’s a graph showing the typical emotional pattern teachers go through every school year. It was pretty spot on my first year, and it’s still pretty spot on this year. I wouldn’t necessarily say I’m ‘disillusioned’ right now, more just neutral, phlegmatic. Even with (especially with?) the daily and yearly ups and downs of this roller coaster ride…I still love teaching. I love reading your observations, Erika. I especially love your #7 entry. Too many new teachers are way too sure of themselves. I’ve learned that it takes many years to become really proficient at the art/science/craft/psychotherapy called “teaching.” The fact that you still enjoy this demanding field and still care about the kids says a lot. You’ll be fine!